High-grade RDX explosive, weighing about 80 kilogram, was used in a suicide attack on a CRPF bus that killed 40 security personnel in one of the deadliest terror strikes on security forces in the Kashmir Valley in three decades, officials said Friday. The attack in Pulwama has prompted the CRPF to tweak the standard operating procedures (SOPs) for the movement of its convoys in the future, by providing additional security personnel in the buses that transport troops to and from the Kashmir valley. Home Minister Rajnath Singh had also said in Srinagar that civilian traffic movement during plying of convoys will be restricted. 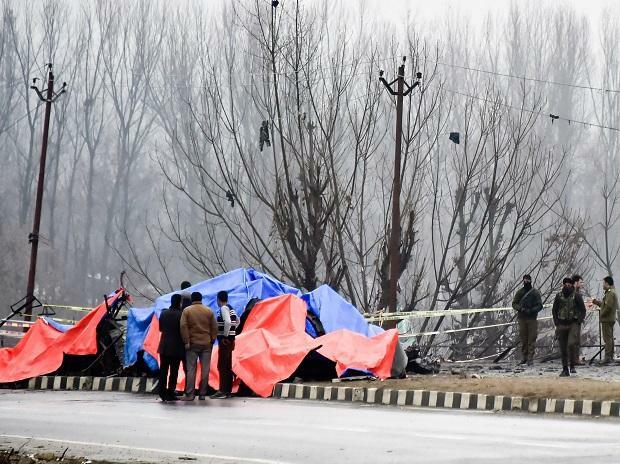 The officials said a post-blast investigation conducted by security agencies has found that "high-grade RDX" of about 80 kilogram was detonated in the blast that was carried out by a Jaish-e-Mohammed (JeM) terrorist after he rammed his explosive laden SUV into the ill-fated bus--HR 49 F 0637--from the left side. The suicide attack took place at the 272nd milestone on National Highway near Latoomode in Pulwama at about 3:33 pm. The officials said the scattered remains of the bus, reduced to blackened bare frames after the blast, does not reflect that an improvised explosive device (IED) was used to target it. The fatal damage can be wreaked by a better grade of explosive like RDX, they said. The attacked bus was the fifth in the convoy of 78 vehicles which also included as many as 16 bullet-proof protection bunker vehicles that had joined the convoy an hour back from the last halt spot of Qazigund to guard troop movement. The suicide attack was a novel way to ambush the convoy by ramming an explosives laden vehicle, leaving little for the mobile contingent's protection units to do, the official said. The terrorist drove the vehicle on the highway from a link road on the Kakapora-Lelhar side and was moving parallel to the bus belonging to the 76th battalion, and the investigators suspect the explosion was triggered, killing all 39 occupants. Assistant Sub Inspector Mohan Lal, deployed on the highway as part of the road opening party (ROP), also got trapped in the blast and was the 40th trooper to be killed. The last such convoy had moved from Jammu to Kashmir on February 4 in 91 vehicles and had 2,871 personnel but all went well that day, they said. The movement of convoys was shut for the last few days due to bad weather in the valley. The killed personnel hailed from Uttar Pradesh (12), Rajasthan (5), Punjab (4), West Bengal, Maharashtra, Uttarakhand, Odisha, Tamil Nadu and Bihar two each and one each from Assam, Kerala, Karnataka, Jharkhand, Madhya Pradesh, Himachal Pradesh and Jammu and Kashmir. There were 27 constables in service profiles of combat, cook, driver and bugler, 12 head constables and an ASI.